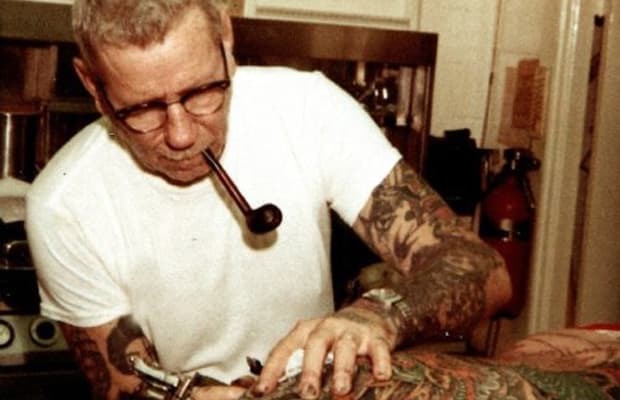 Lucky citizens of New York, Chicago, and New Orleans: This Saturday, January 14, Sailor Jerry will give away 101 free tattoos featuring the designs of Norman Collins, the legendary tattoo artist whose art the liquor brand uses for their bottle design and marketing campaigns. If you&apos;re in New York, you&apos;ll want to be at Fineline Tattoo (21 1st Ave.) from 12 p.m. to 10 p.m. If you&apos;re in Chicago, head to The Chicago Tattooing Company (1017 West Belmont) from 12 p.m. to 12 a.m. If you&apos;re in New Orleans, swing by Uptown Tattoos (575 South Carrolton Ave.) from 12:30 p.m. to 12 a.m.
Click to the second image for a look at the free ink options.